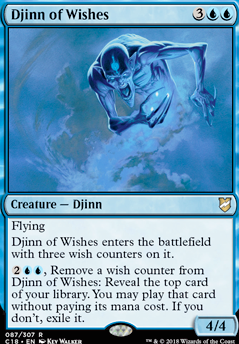 Djinn of Wishes enters the battlefield with three wish counters on it. , Remove a wish counter from Djinn of Wishes: Reveal the top card of your library. You may play that card without paying its mana cost. If you don't, exile it. 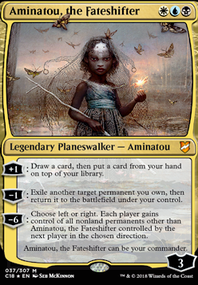 I like that you removed the red from this and went with Aminatou, the Fateshifter . I would remove Venser, Shaper Savant. He's great because he is an Unsubstantiate, but after that he's just a Will 'o wisp. Hostage Taker is giving you very real card advantage, ramp, or removal. Here's some other tech I've found: Primordial Mist was in the precon for a reason. You can blink the manifest cards to flip them for free. 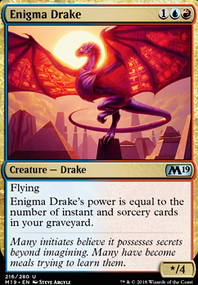 Djinn of Wishes is fantastic with your commander. 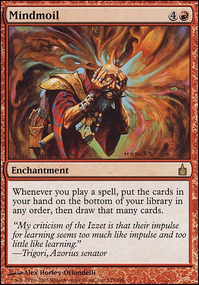 Perplexing Chimera is one of my favorite cards to use with Venser the Sojourner, and Animatou has that same synergy. 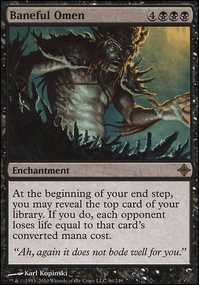 I’m not a fan of the primordials since their value relies on what your opponents have in their graveyards. You can go aggro control. Most of the creatures do hurt (5 power) with effective etb effect/s. Flickering them reuses their etb and give pseudo vigilance. 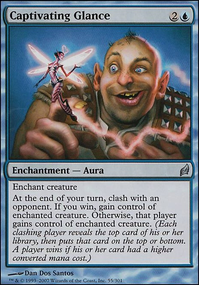 I will raise a disclaimer that esper tends to run "good stuff" because, well, there are good spells that have little to no alternates.